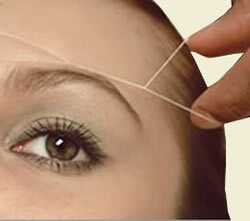 Threading is an ancient Eastern world method of removing hair mainly from the face. The treatment is undertaken by using a piece of pure cotton thread that is twisted and held between the hands in the form of a Cat’s Cradle and then pulled together to trap hairs; thus plucking them out from the root-at follicle level. This method means that, unlike tweezing where a single hair is plucked, a row of hairs can be pulled out at once, resulting in a straighter line. This can be slightly more painful for some, but is very quick with long-lasting results. Threading is also a great alternative for those with sensitive skin, as the top layers of skin are not being traumatized by waxing /depilation or shaving.